I like the interesting shape of the tree against this splendid view! The frame is perfect . Lovely place for hiking , doing outdoor or just soak up nature . Lovely composition, I'm a big fan of dead trees. So "unreal," like a painted movie still for a Hitchcock drama with the protagonist (Cary Grant) sliding down the rocks to escape the bad guys. The burnt ponderosa suggests the menacing threats. Can he make it across the lake to the other side, through the forests up into the mountains?? Yes, oh, yes! 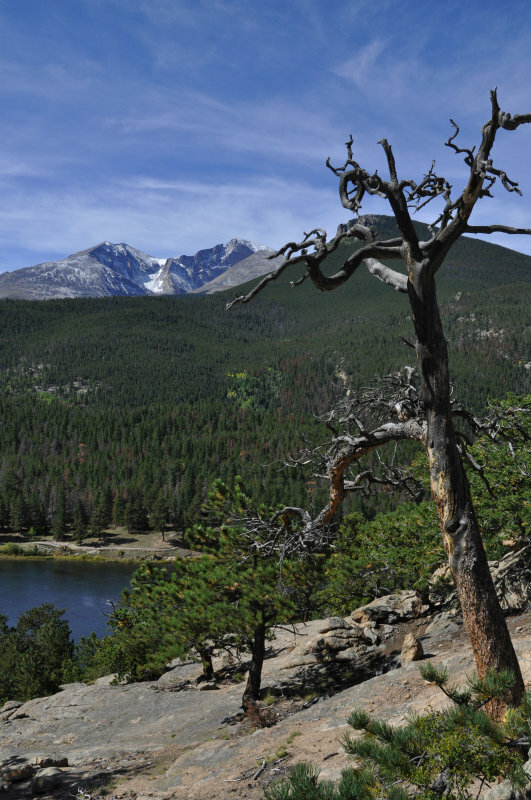 Strong composition from this vantage point shows us an expansive view over the lake and forests to the mountains. Wonderful range of colors and a nice sky with the wispy clouds. Top work David! "V"